Gluten free brioche version two. Gluten's had a bad rap of late. It's the uninvited guest at the table; the dodgy bloke who married your favourite cousin. Gluten upsets people after all, especially after the meal. Why do we bother with him at all? If you're a baker, all your experience, of feel, of texture, of look... will be of gluten. It means glue in Latin and it binds bread. That's what bakers do: develop gluten. We look for that transformative shine and elasticity in a dough. You can even hear it as the dough hook spin changes from mud slick to wet slap. That's gluten. Without it you don't have dough, you have batter. Yes, I'm simplifying. Oh look, hang on... as Jennifer Aniston once said in a shampoo ad... here's the science. The science of baking is highly complex and not that well researched. 'Myths' seem to be busted on a monthly basis. Flour is essentially a mix of starch and gluten. What we call gluten is a composite protein - the linkages between glutenin and gliadin - that has elastic properties. Gluten is created by kneading because this flattens out the proteins but it can also be formed chemcially or fermentatively. Put more prosaically: gluten creates the matrix of bread that captures the tiny carbon dioxide gas bubbles produced by the yeast - fed by the sugars and the starch - that forces the dough to swell and expand. Gluten hardens when baked, encasing the bread in a crust. So you can imagine that creating bread without gluten is problematic. How to capture the carbon dioxide so essential to leavening the dough? Creating a brioche without gluten is even worse. Almost anything mixed in with flour tends to have an inhibitory effect on yeast. Salt is especially bad but without it the bread tastes of little. Brioche of course has lots of eggs and butter which makes it delicious but a bit of a bugger to rise. That butter (like all fats) and sugar also affects gluten development but as there's none here, that wasn't an issue. The reason I was making a gluten free brioche was because friend-of-the-restaurant Nicole was bringing Victoria to celebrate her birthday, her twenty first I think, and the group included a guest, Liz, who suffers with a severe gluten intolerance along with several other foodstuffs. I was making my new dessert of pan fried brioche jam sandwich with peanut butter ice cream but I didn't want Liz to miss out. And it was the arse end of August and I didn't have much to do. I didn't need to include this picture but I chose to. 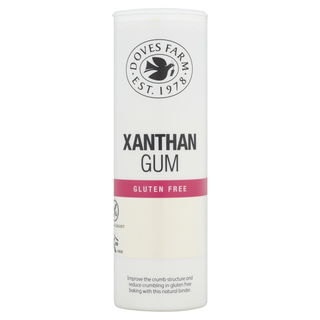 Many gluten free recipes use Xanthan Gum to give structure to the bread. Xanthan Gum sounds like a Swedish metal band but you buy it as a whole powder. You'll find it in supermarkets in the 'home baking' section. It's a natural product, often made from milk whey, a byproduct of cheese making. Mixed with water or oil it thickens and so can be used in bread to catch those carbon dioxide bubbles. It's not as effective as gluten though. Xanthan Gum is remarkable stuff. It's also used as a stabiliser and emulsifier in products as diverse as salad dressing, sweets, soap and shampoo (hello Jennifer). It's used in oil drilling to stiffen up slack soils! Now I have some I'm going to experiment with it. Many ice creams use it to improve 'mouth feel'. I tried several recipes for gluten free brioche including this one from the French Laundry. To my surprise, the best (on this occasion) was my own. I'm making a note of it here for my own benefit. It's not been thoroughly tested yet so be wary if you use it. My success might have been a one off. I based my bread on Dove Farm's gluten-free flour. There are many recipes that ask you to create your own starchy mix from elements such as cornflour, potato starch, tapioca starch, brown rice flour etc. I have no experience of most these things so kept it simple. A little digging in the comments section of Dove Farm's website reveals their mix to be rice, potato, tapioca, maize and buckwheat, with rice flour making up about half. There's nothing hard about this recipe. if anything, it's easier than standard brioche. If you're familiar with gluten free baking you'll no doubt have the ingredients to hand. 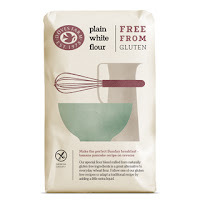 Mix 7g dried yeast (the one for hand baking not for bread machines) with 300g of Dove Farm gluten free flour, 50g caster sugar, a teaspoon of xanthan gum and a teaspoon of table salt. Add 70ml of room temperature milk and three eggs whisked. Beat together until well mixed. Now add, in small pieces, 100g of best butter, also at room temp. Don't whack it in straight from the fridge, it won't integrate properly. Beat for around 5 minutes, depending on your machine or your biceps until you have a rich, luxurious batter. After around eight minutes of beating. This won't look anything like a normal brioche dough; nothing like bread at all. It's much more akin to a Victoria sponge. Pour this into the tin you'll be baking with, cover with cling film and leave in a warm spot. If you have a bread proving oven setting, so much the better. I didn't see the point in the traditional chilling and second proving. There's no gluten to develop and who knows what these starches are doing. I glazed mine with a yolk/milk mix. This adds nothing but a little shine. If you enjoy matt bread, save your money. Now you wait. This baby takes a while to rise. It probably won't double in size. It'll be more than two hours; expect three to four but don't give up before six. You want to make this the day before you need it. Maybe I should have mentioned that earlier. After... some... time... remove the cling film if the the mix is threatening to make contact. Once you're bored of waiting and you're convinced it's all risen, bake for around 35 minutes at 200°C. This last part of the recipe is my least certain. I feel that, as with many wet breads like focaccia, a faster, hotter bake might be better but, but, but... this is more like cake than bread. Oh, I don't know. I might try two teaspoons of xanthan gum. I read one American recipe that called for two tablespoons! But that surely would be... gummy. This was the result. A decent crumb and texture and the taste is excellent. I'd love some feedback from gluten-free bakers, especially if you have that 'killer' brioche recipe. This was after... such are the transformative and restorative powers of the New River Restaurant. And no idea who this fella is but I think he loves the Welsh.